New dining in old digs. Photo courtesy of West 36. From gluten-free to all-the-meat-you-can-eat, the food and drink scene in London is having a moment right now. (Still.) We dined and drank our way around some of the buzziest spots in town. LONDON – Eaters can no longer write off England as a country without culinary hotspots and trendsetting menus. In fact, you'd be hard-pressed to find traditional English fare like pie and mash, eel, or even fish and chips on your list of must-try restaurants in London. No, nowadays diners are ordering raw foods and gluten-free high tea and sipping wines in old banks converted into swank members-only clubs. And here are the places where they're doing it. 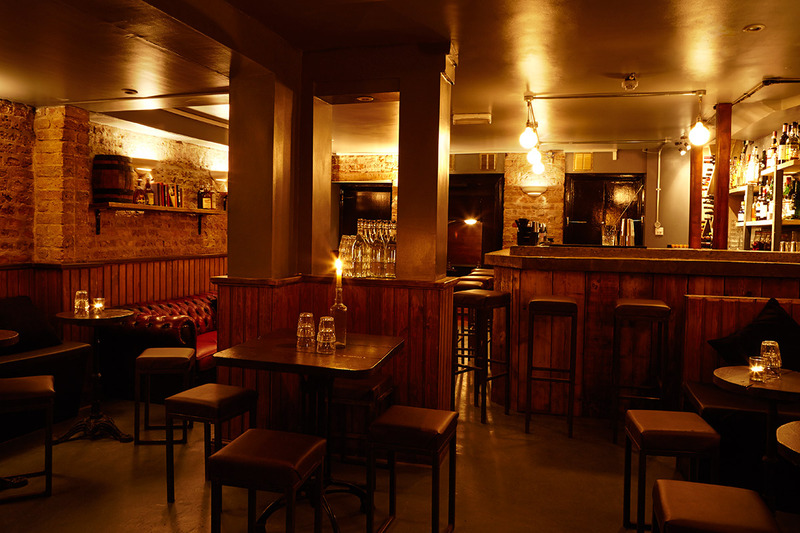 The Clapham cocktail bar and eatery is swish and sophisticated in an understated way. The decor is eclectic, as if plucked from antiques stores, and the stand-out menu includes great British produce, Scottish sheep cheese, lobster rolls, and truffle cocktails. A cozy, intimate restaurant nestled into a corner of Shepherd's Market — a once vice-ridden enclave inside the well-heeled Mayfair neighborhood. The food — "Modern British fare with a Spanish twist" — feels very British: hearty and filling, with an emphasis on meats and cheeses. One of the most exciting redevelopment areas in London is around King's Cross train station. It's the new home of fashion school Central Saint Martin's, the King's Cross Pond Club (an outdoor swimming pond), and German Gymnasium, a fabulous restaurant addition housed in a beautifully restored warehouse that just opened in December. The interiors are stunning, and the place is truly buzzing at night. Of special note are Tyrollean hay speck and foie gras with smoked eel terrine. The dining room at West 36. Photo courtesy of West 36. On the trendy food street a stone's throw from Portobello Market, the all-day diner feels like an old-world country home filled with hipsters eating in hidden nooks and crannies, sitting on deep sofas and gathered around generously-sized wooden tables, feasting on the artful, high-end dishes like roast cauliflower with hazelnut and pomegranate, aged beef, and kimchi salad. 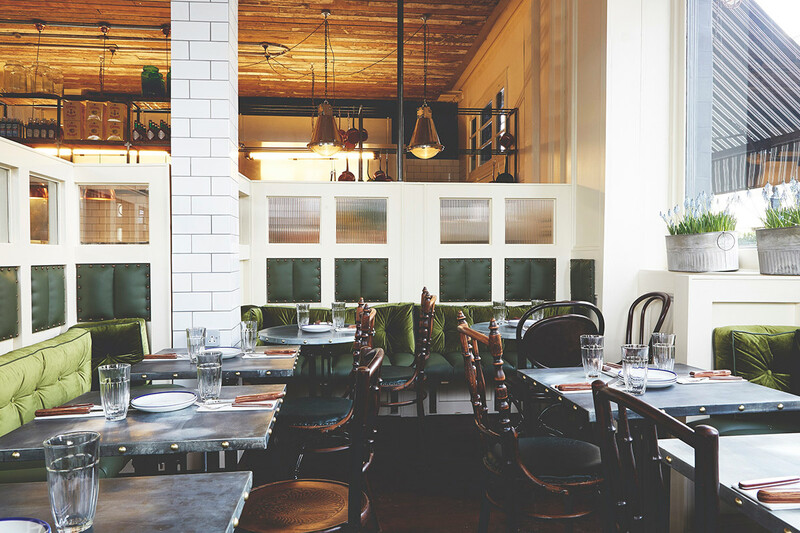 London's first raw seafood restaurant sits in hipster East London, in a revamped pub with spacious wooden interiors. Attracting a young crowd, Australian chef Brett Redman serves a wide variety of oysters and yummy dishes like hake and salmon croquettes. The Alcove at Bellanger. Photo by Nick Ingram / courtesy of Corbin and King. Restaurateurs Corbin and King, who feed cool London better than anyone at such mainstays as The Wolseley, The Delauney, and The Beaumont, have a new Islington outpost. 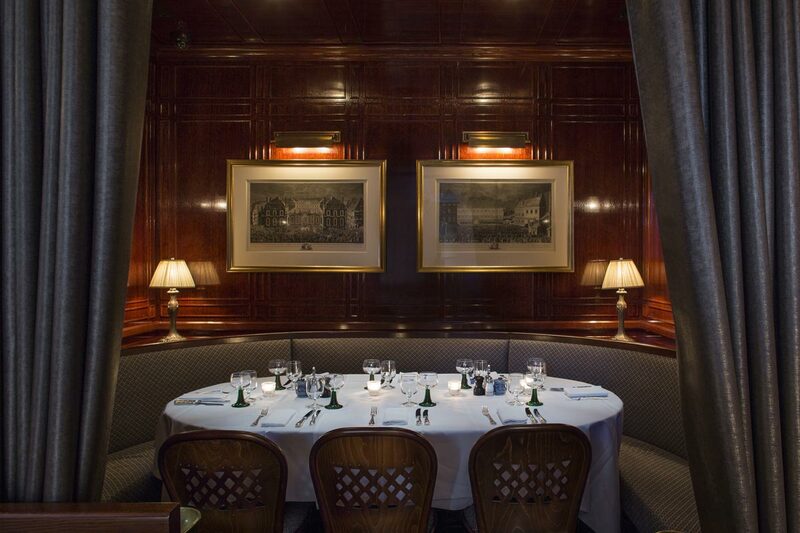 Inspired by Alsatian brasseries in Paris, the menu includes tartes flambées, coq au rieslin, and veal schnitzel. It's open seven days a week and serves until late (bless them). There are two things afoot at the InterCon: The innovative Guiltless Afternoon Tea has no refined sugar, and can be served with gluten- and dairy-free scones, sandwiches, truffle cakes, and otherworldly deserts. The extensive perfumed tea menu comes courtesy of Floris, the oldest family-run perfumers in the UK. If you're feeling especially royal, it could be because the hotel was built on the site of The Queen's childhood home. The hotel's award-winning Italian restaurant, Theo Randall at the Intercontinental, just reopened after an interior overhaul that included the addition of a kitchen table and a second private dining room where Randall will teach master classes. The terrace at Boneyard. Photo courtesy of Boneyard. A carnivour's guilty pleasure. Photo courtesy of Boneyard. 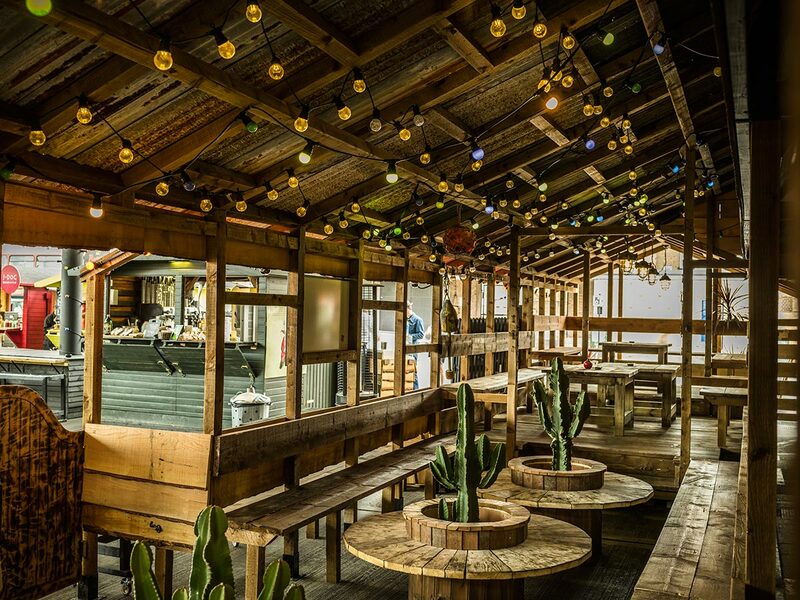 Pump is the outdoor market in a converted gas station on Shoreditch High Street, and Boneyard is its flagship eatery. 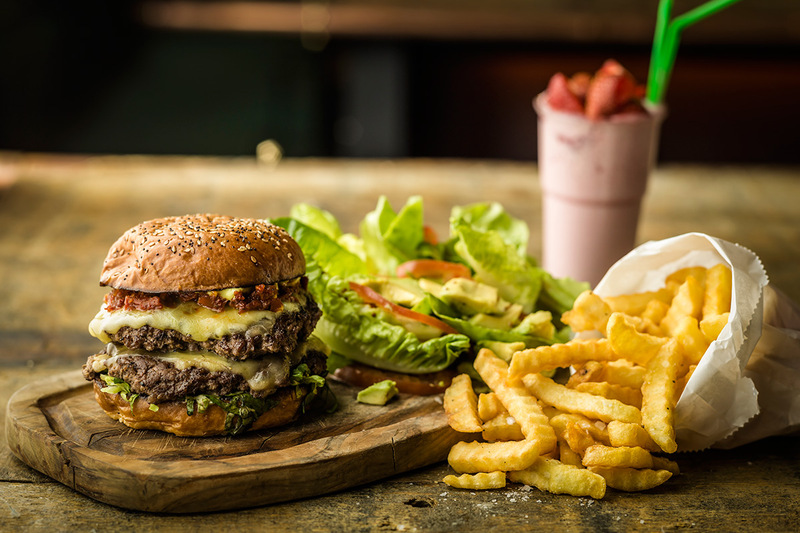 The American-style meat join serves mouth-watering racks of ribs, marrowbone burgers, and amazing green salads. This is the place where hungry carnivores come to pig out. The Lanesborough reopened in July 2015 after an extensive, two-year refurbishment of the glorious Regency landmark that was once a hospital. At the helm of its fine dining restaurant Celeste are executive chef Florian Favario and "chef patron" Eric Frechon, the three-Michelin starred chef of Le Bristol Hotel. Here, under elaborate chandeliers and a glass-domed roof, they serve five-course tasting menus, including a vegetarian version, for a reasonable £85 and £75. A la carte items include caviar tartlet with onion confit and smoked eel, langoustine ravioli, and venison smoked on juniper wood. The Oscar Wilde Bar, one of the most opulent golden rooms in London, is a great spot for afternoon tea, but all eyes are on the Cafe overlooking Regent Street, which just introduced the city's first all-dessert menu. Every night, executive pastry chef Sarah Barber will serve a menu that starts with savory and ends with sweet and comes with optional wine pairings. Fun themed menus include Sarah in Wonderland, with entrees called Queen of Hearts, Mad Hatter, and the all-too-appropriate Eat Me, Drink Me. The former St. James banking hall designed by Sir Edwin Lutyens, the architect responsible for New Delhi, has become a new private members club for wine connoisseurs. But its dining options make membership for those in London for a stretch worth it. And it's more dignified than begging for a table. Head chef Marcus Verberne, who has worked in a who's-who of London kitchens (Hix, Le Caprice, J Sheekey, The Ivy restaurants, The Brown's Hotel, Roast) designed a menu to complement the extensive wine list. 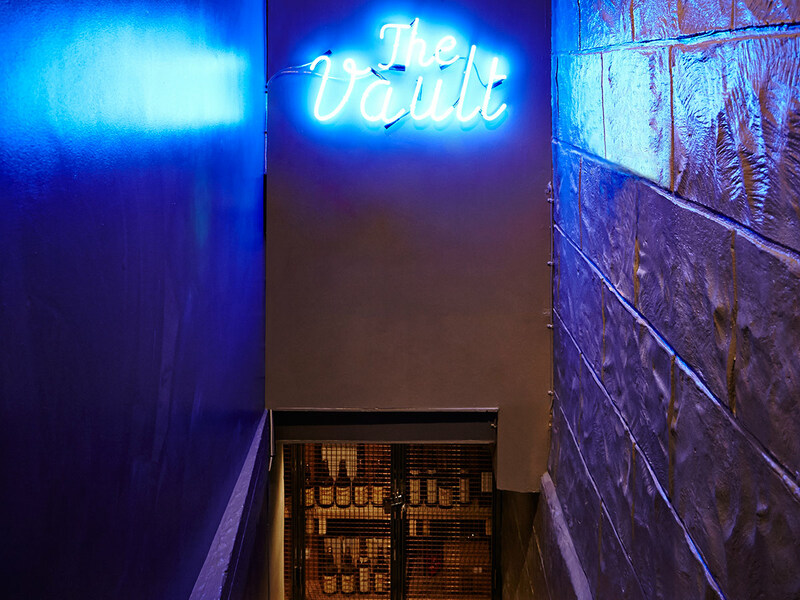 The entrance to The Vault. Photo courtesy of The Vault. 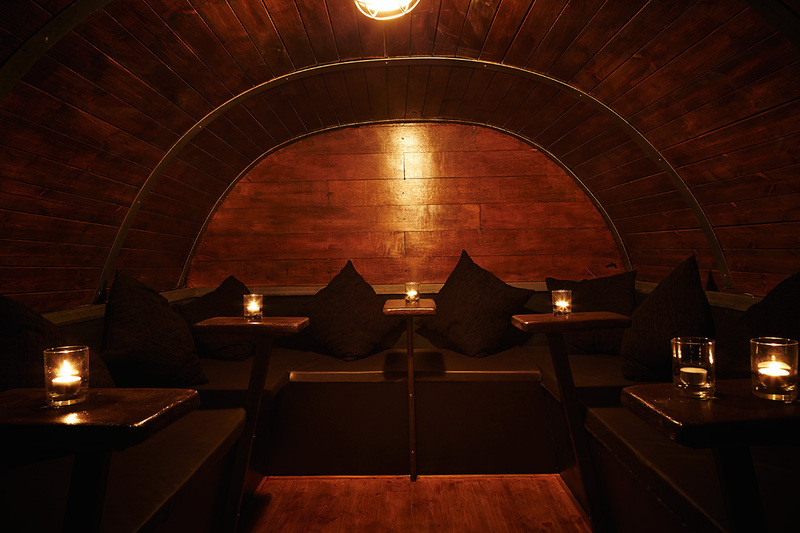 The subterranean bar. Photo courtesy of The Vault. A cozy alcove. Photo courtesy of The Vault. Milroy's, the oldest whisky shop in London, was recently revamped by a young entrepreneur who added a subterranean cocktail bar called The Vault. This is the place to come for liquid meals, where the interesting menu items are the specially sourced ingredients that go into the stand-out cocktails, like Japanese matcha tea, Creole shrubb, and tomato water basil bitters. Upstairs, one can drink by the glass or buy every whisky under the sun for more nourishment. The French bistro on the ground floor of the Mandarin Oriental in posh Kensington is the only London restaurant of Michelin-starred chef Daniel Boulud. 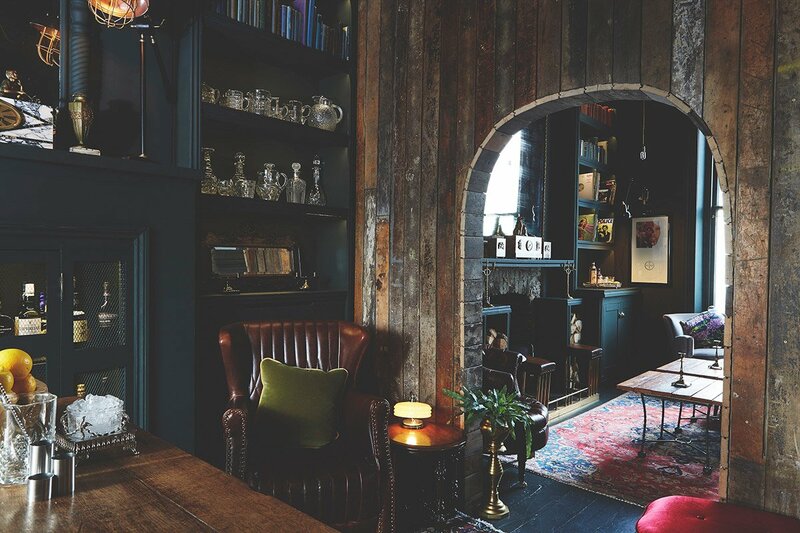 It's not new, but it's cozy and buzzing, with the heat of fellow Londoners. The comfort food menu includes coq au vin, seared scallops with celeriac and crispy pork skin, a selection of burgers ("Piggie," "Frenchie," "Yankee," and "BB"), and deserts like poached pear with creme anglaise. Good for a date, a family gathering, or a foodie night out. The restaurant upstairs from Bar Boulud at the Mandarin has two Michelin stars and was ranked #7 of the 50 Best Restaurants in the World. Which is what one would expect from star chef Heston Blumenthal, who is known for celebrating British produce and the art of dining. Executive chef Ashley Palmer-Watts oversees London's most inventive menu, which underlines its roots in culinary history, including meat fruit (dating back to 1500), Earl Grey tea-cured salmon (1730), cod in cider (1940), brown bread ice cream (1830), and sambocade (1390). Watching the chefs at work through the glass-walled kitchen only adds to the entertainment. Late last year, the in-house restaurant at One Aldwych became one of the first in the city to offer an entirely gluten and dairy free lunch and dinner menu under the tutelage of chef Dominic Teague. Check out the yummy gluten free fish and chips or dairy free chocolate mousse, or enjoy cocktails in the bar in this popular after work drink spot and buzzing central location.